Updated 10 March: It’s already billed as the second biggest carnival in the world after Rio de Janeiro’s, but now, as Santa Cruz celebrates the final day of the city’s carnival, organizers say that yesterday’s Carnaval del Día had record crowds with over 400,000 people crowding the capital. There will be as many tonight, they expect, for the Fin de fiesta party in procession before culminating in the Plaza de La Candelaria to the side of the Plaza de España’s fountain outside the Cabildo. The attention of many, especially in the south, will now switch to Los Gigantes where carnival starts next Friday (programme HERE) and Los Cristianos starting on the 21st (programme HERE). Updated 28 February: Santa Cruz now has its carnival queen for 2019! Last night’s gala had a record 19 candidates but the winner in the end was 22-year-old Priscila Medina Quintena representing Autoinsular Citroën in a Fantasía called La Nuit designed by La Victoria de Acentejo atelier Sedomir Rodríguez de la Sierra. The designer workshop specialises in couture gowns for fiestas and weddings, and they could find their victory last night brings them no end of customers because one can easily imagine this fantasia on the red carpet being worn by Rihanna or Beyoncé rather than the traditional fantasia which is more like a magical mechanical masterpiece on wheels! (Click the image left to see full size). Priscila herself says that she’s still coming to terms with her win and doubts she’ll believe it until she sets foot, in her fantasia, on the streets of Santa Cruz in Friday evening’s opening parade. 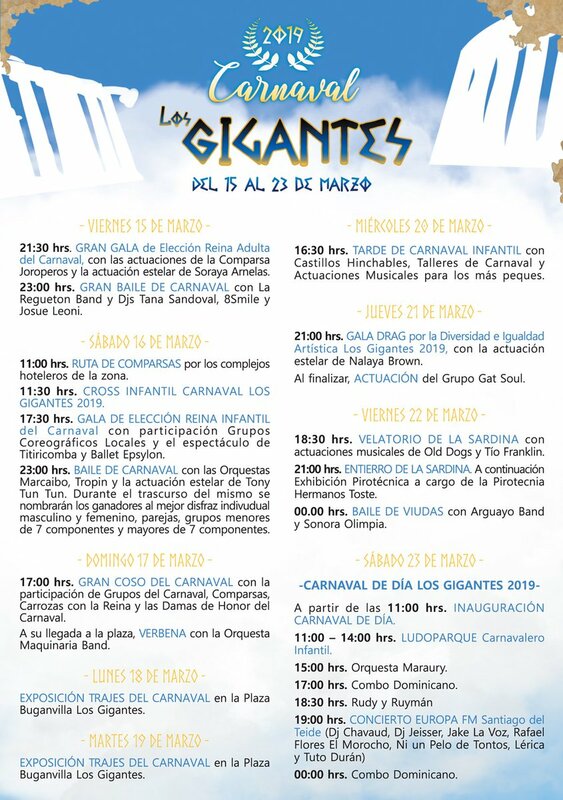 Meanwhile, Los Gigantes, has announced that its own very popular carnival with the theme of the Olympian Gods will take place between 15 and 23 March and the programme is HERE. Updated 27 February: For some, perhaps many, it’s the highlight of any carnival when the carnival queen is chosen, and tonight is the night in the Santa Cruz Carnaval. It’ll be live on La2 from 9.30pm, and with the ceremony over, Carnaval spills onto the streets of the capital. The opening parade is this Friday, 1 March, leaving the Plaza de la República Dominicana around 8pm and then proceeding via avenida Asuncionistas, Ramón y Cajal, Galcerán, Plaza de Weyler, Méndez Núñez, El Pilar, Villalba Hervás and La Marina, terminating in avenida Francisco La Roche. There’ll be a few sleepless nights in Santa Cruz over the next ten or so days! Updated 23 February: Carnaval season is now in full swing. In Santa Cruz, the murga groups have competed and now the music and dancing groups have taken the stage and the carnival queens are being chosen: the young and mature queens have been chosen with the main Reina gala this coming Wednesday. After that, carnival will spill onto the streets of Santa Cruz for a full-blown party culminating in the burial of the sardine. In Puerto de la Cruz carnival is also underway with the carnival queen being chosen on Thursday coming. The full programmes are HERE for Santa Cruz and HERE for Puerto de la Cruz. Los Cristianos carnival starts on 21 March, and its programme is HERE.